Zac Efron and Jim Parsons film a courtroom in February 2018 in Northern Kentucky. 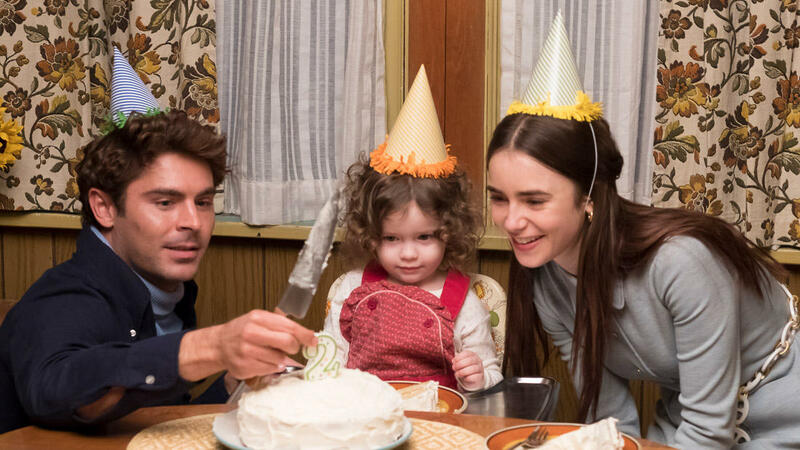 Zac Efron's Extremely Wicked, Shockingly Evil and Vile, shot here a year ago, will play in theaters this fall to be eligible for movie awards, the Hollywood Reporter says. The film about 1970s serial killer Ted Bundy, which drew rave reviews for Efron (but not the movie) at the Sundance Film Festival, was purchased by Netflix after its Sundance premiere last month. The streaming giant would get U.S. and some international rights for "a staggering $9 million," the trade publication reported. "Netflix will give the pic an awards-season theatrical run in the fall," says the Hollywood Reporter. 'Extremely Wicked' is told through the eyes of his girlfriend Liz, played by Lily Collins (right). Netflix was a logical place for the film directed by Joe Berlinger. He also directed Netflix's Conversations With a Killer: The Ted Bundy Tapes documentary series. Extremely Wicked tells the story through the eyes of Bundy's longtime girlfriend Elizabeth Kloepfer (Lily Collins from To The Bone, Rules Don't Apply), called Liz Kendall in the film. Because she didn't witness his crimes – which led to his conviction and electric chair execution in 1989 – the film doesn't show his deadly encounters with women. Berlinger recreated trial scenes in Northern Kentucky in which Bundy was his own attorney with Jim Parsons (The Big Bang Theory) as the prosecutor, and John Malkovich (Being John Malkovich, In The Line Of Fire, Places In The Heart) as judge. The cast includes Dylan Baker (The Good Wife, Selma), Angela Sarafyan (Westworld, American Horror Story), Haley Joel Osment (The Sixth Sense, Forrest Gump), Jeffrey Donovan (Burn Notice, Fargo) and Metallica founder James Hetfield. Bundy preyed on women in Washington, Utah, Colorado and Florida in the 1970s. He confessed to 30 murders before his death.